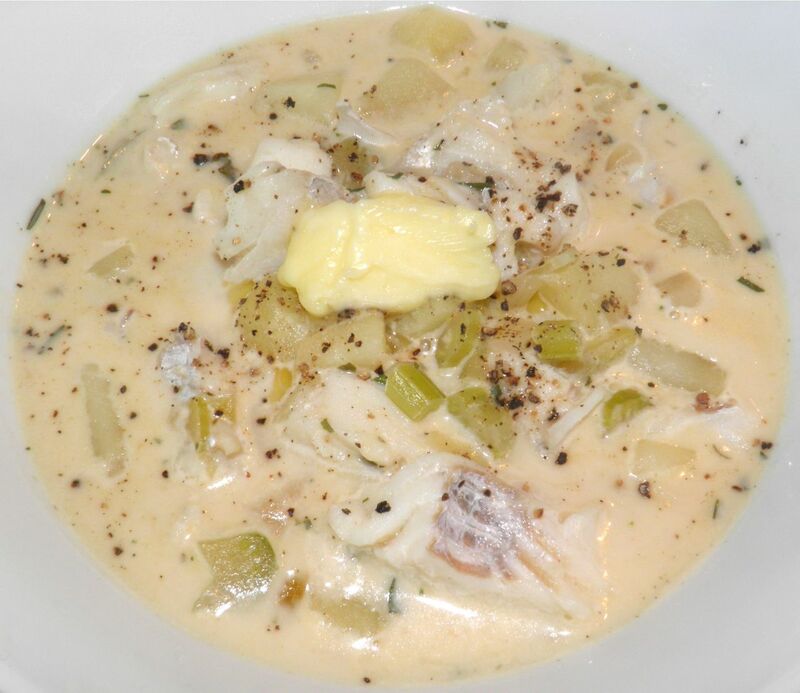 Nothing says comfort more than fish chowder. I thought I would post this old time recipe because it’s such homey comfort food. If you’re ever down, or feel a bit off, old recipes from childhood can bring back memories of love, safety and comfort. Those memories can actually make you feel better inside. I remember this recipe from when I was very young. 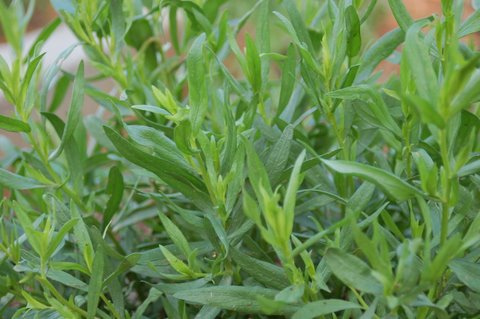 It’s fairly easy to make, is good for you, and doesn’t cost an arm and a leg. It also lets you serve a family of four with everyone being able to go back for more if they want. Of course my mother never used tarragon or Dijon mustard. For the life of me I really can’t remember what herb she would have put in. Maybe none... 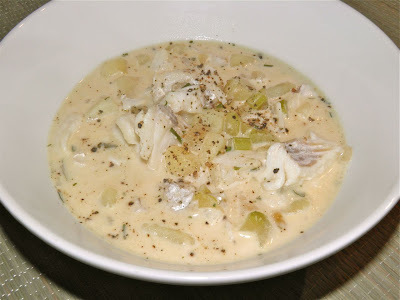 I do know that these two additions do not alter the wonderful homey goodness of this chowder. They improve it. Some people are afraid of cooking, or hate the taste of, fish. I assume that is from bad past experiences. The secret to great tasting fish is twofold and simple. First, ensure you purchase the freshest fillets you can. Fresh fish should have a translucency to it. It should not be “chalky." The less fresh the fish the more opaque it looks. The second is to never, never overcook fish, regardless of the type or method. 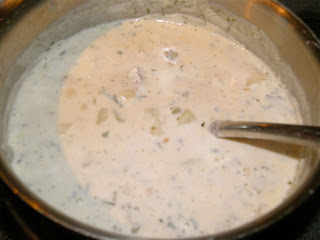 Overcooking it, even in a chowder, can make it “tough” and almost “dry”– for lack of a better word. Follow these two rules and you’ll always have delicious success. I hope you like this recipe because it’s from the hearths of Nova Scotia and the heart of every country grandmother in the province. Enjoy! Melt the butter in a large stock pot. Chop the celery into fairly fine pieces. Peel and chop the onion the same way. Add to the pot and sauté until the onions start to brown. This should take about 5-6 minutes. While the onions are sautéing, peel and cube the potatoes into 1/2” squares. When the onions are done, add the water to the pot and add in the potatoes. The water level should just cover the potatoes. Add more if necessary. Add about 1 tsp each of salt and pepper. Bring to a boil, reduce heat to medium high and let cook for 10 minutes. Once the potatoes are cooked, add the evaporated milk and whole milk. Stir in the Dijon mustard and tarragon. Add another 1/2 tsp of salt to the pot. Cube the haddock into fairly large chunks. Add to the pot, stir gently and let the mixture come back just to a boil. Stirring too much will break the fish pieces. We do not want that to happen. By the time it reaches a simmer the fish will be cooked. Do not overcook. Taste and adjust the salt and pepper if necessary. To serve ladle into bowls, place a bit of butter on top and sprinkle with more pepper.